Strathpefffer is known as a centre for cycling in the Highlands. 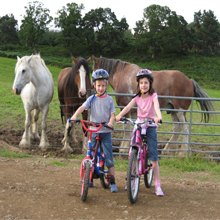 From the 24 hour Strathpuffer endurance event to family cycling holidays, the village is the hub of cycling in the area. The footpath through Blackmuir Wood and the path up to Loch Kinellan are also cycle paths. Peffer Lodge has secure storage for bikes in the garage. Strathpeffer has it's own bike shop. Square Wheels will caters for all your cycling needs from mountain bike hire to advice on the many tracks that are available to cycle on, they are located in the village square.